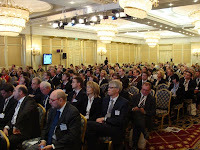 The Russian hotel market will not escape the current global economic crisis unharmed, but panelists here at the Russia & CIS Hotel Investment Conference felt that is was better positioned than other areas of the world. 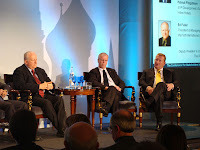 Dr. Daniel Thorniley, SVP, The Economist Group, right, warned attendees about 2009. Thorniley said that a 4 percent GDP growth would be painful for Russia, but hoteliers needed to realize that China’s growth will plummet from 10 percent to perhaps 7.5 percent, and even those numbers will be 5 to 10 times what Western Europe and the U.S. will see. He said that the U.S.’s mid-case is zero growth, its worst case is -1 or -2 percent growth and the U.K. is looking at a very tough next 12-18 months. 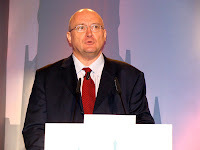 Arthur de Haast, global CEO, Jones Lang LaSalle Hotels, noted that hotel transactions through September 2008 are down 70 percent from 2007, and what had been a slow and moribund market has died. But he said that 2008 will still be better than in the wake of 9/11 and the 1997 Asian economic crisis. “We have experienced periods like this before, and we will see improvement going forth,” said de Haast. Thorniley feels that the next 18 months in Russia will be tough, but there is a silver lining of schadenfreude. “However tough business will be in Russia and Central Europe over the next 18 months, you can always be happier that somebody doing business in Germany or France or Spain or Japan or America or Latin America will be doing much worse,” said Thorniley.